Destination Ghost Bikes – Worth A Visit! 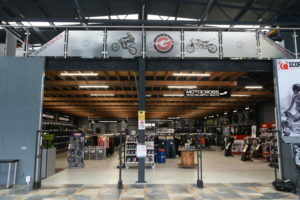 Our Charlie pops oop north to see Ghost Bikes’ new ‘shop’, although calling it that would be a disservice to the huge amount of work they’ve put into their new biker destination – over to Charles! 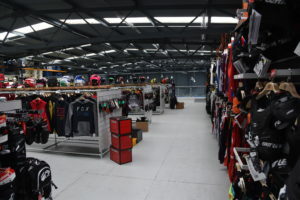 It’s rare in the current financial climate to hear of any new retail outlets opening, let alone one dedicated to bike apparel off the back of a successful online business. But that is exactly what GhostBikes.com have done with a huge premises just off of the M6, back-set from Mercer Street as you head into the centre of Preston. 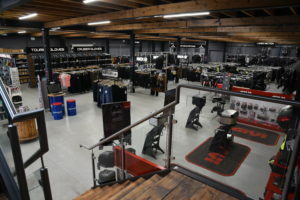 Far from ‘just’ a shopping experience owner Adam and team have been mindful to cater for the needs of us riders, introducing a few novel features that make the GhostBikes store more of a destination for experience than purely a retail one. When I first entered the premises I was immediately impressed with the size of the place. To my left a huge TV screen showing an onboard lap of the TT, to my right the toilets with shower rooms and baby changing facilities and two floors with a vast array of apparel. 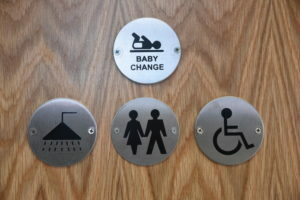 There are plans for the entrance ‘foyer’, at present there is work going on, knocking through to a kitchen that will shortly offer catering to visitors, from tea and coffee to event catering for large bike orientated groups. There are already chairs and tables in the area, all pointed toward the big screen that will showcase live motorcycle racing and events. 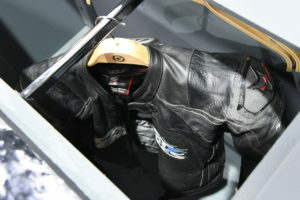 There is also ample ‘storage’ for your gear, behind the seating are cabinets with hangars that you can drop your jacket into, closing the top and popping your helmet down securely next to a 3-pin plug and two USB ports per station to charge your phone, cameras, heated clothing, etc. 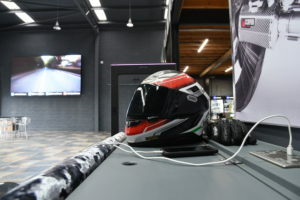 It’s all designed for you, the rider, enhancing your experience so that you no longer struggle around the store with what can be cumbersome gear. If you have come a long way to meet friends to all watch the MotoGP together, for example, and need to freshen up, ask for a towel and get your free hot shower! This is no motorway service station truckers shower either, it’s as you would expect to find it at home. If you are shopping, well, what are you after? 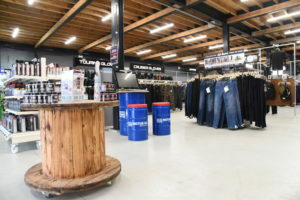 Everything seems to be covered, from road based sports and adventure style gear ranging from the high priced end of Dainese and Alpinestars through to your more affordable Spada, Richa and G’Bikes’ own brands – Black and Agius. There are performance based products like Scorpion exhausts, adventure luggage from Givi with a range from Oxford Products, locks and lubricants available. This is all on the ground floor. 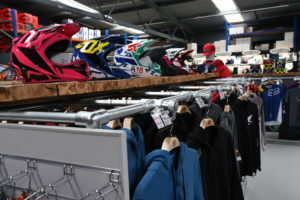 Head upstairs and the right hand wall is floor to ceiling helmets with internal racks of boots and the largest range of offroad and MX gear that I have seen in a non-specialist bike retailer. Add to this branded casual gear and you can pretty much say that there is something for everyone. You can also be reassured that they will stock your size, Ghostbikes.com is at the same venue behind the shop walls. This online business keeps a steady flow of DPD and UPS drivers employed and means they have plenty of stock so a visit will rarely end in disappointment. Not satisfied with just providing a destination and store, GhostBikes have also just held their first open day, an estimated 5,000 people attended the free event benefitting from live bike demonstrations, the biggest and coolest bike scalextric I have ever seen and TT favourites John McGuinness and local Lee Johnston in attendance. So far it’s a success story that I am happy to report on, given the rarity of something this big and this new serving the motorcycle public. 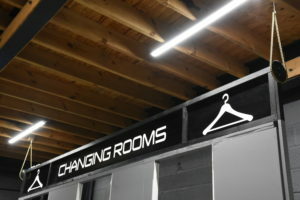 It is worth a visit, if not to shop then to see as a huge amount of work has gone into the place from the smallest detail of bike sprockets and chains used to hang the changing rooms, to giving you the biker a very positive ‘experience’ indeed. 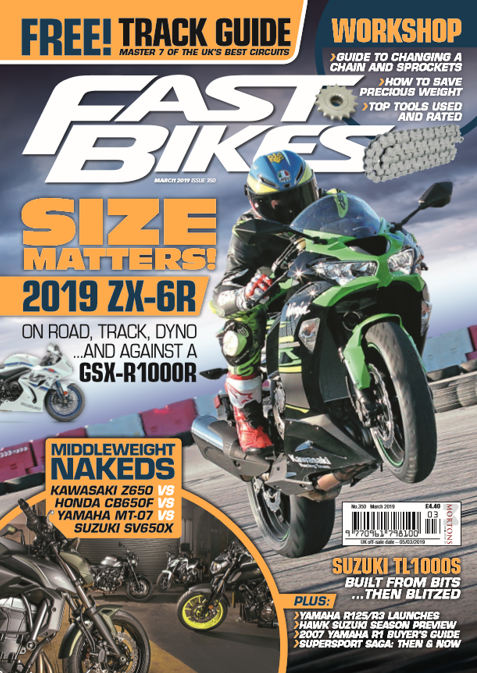 Previous Post:Suzuki Hayabusa Vs Kawasaki H2 SX SE – Out Now! Next Post:WSB 2018 – Donington – 10 Things!